So there was this period of time from mid-September 2015 to mid-October 2017 in which I didn’t write a single blog post. What happened? This post is my attempt to reflect on my hiatus from blogging. The most convenient answer—and the one most friendly to my ego—is that I had simply gone through some Major Life Changes that got in the way of devoting time to this blog. However, if I dig deeper, I must admit to myself that October 2015 is when I started playing a free Japanese mobile game called Puzzle and Dragons (PAD), and October 2017 was when I started to get tired of playing it; I finally deleted the game from my phone last week. Left: A random person's monster collection. Right: a monster card in all its glory. 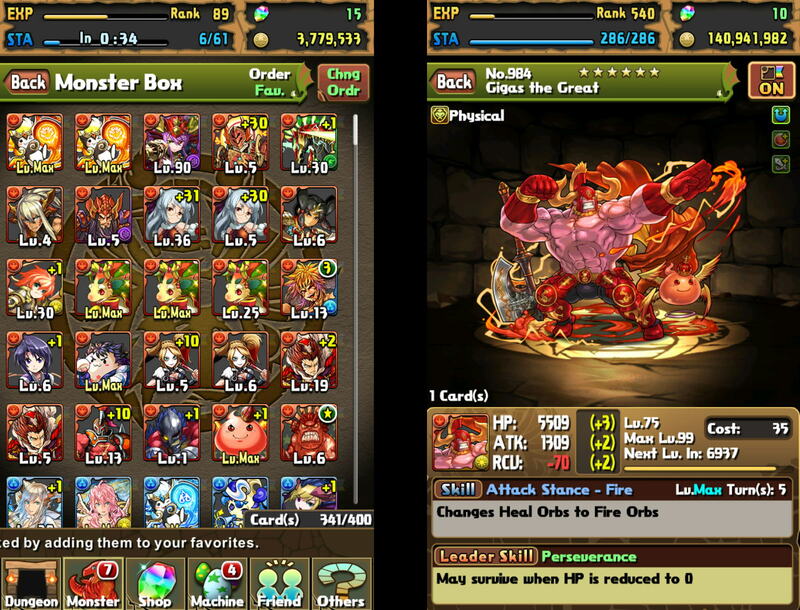 The basic gist of PAD is that you assemble a team based on different “monster cards,” each of which has different properties. You obtain the best cards by spending “magic stones” on a Rare Egg Machine, which pops out a random monster card at a cost of 5 stones. The stones can be earned for free by beating levels in the game or purchased for $0.99 each (or only $59.99 for 85!). With your team, you fight your way through various dungeons, doing damage to the enemies based on how many orbs of the same color you can match in rows or columns of at least 3 on the game’s puzzle board. As with any decently fun game, it felt rewarding to finally beat a difficult level after multiple tries. And the artwork and graphics, hand-drawn by Japanese artists, were top-notch. But in addition to these basic features shared with most games, PAD has many mechanisms that increase its ability to grab ahold of players’ attention, time, and money, and these psychological manipulations are very clear for me to see in retrospect. Left: Narrowly escaped death from the enemy's attack. 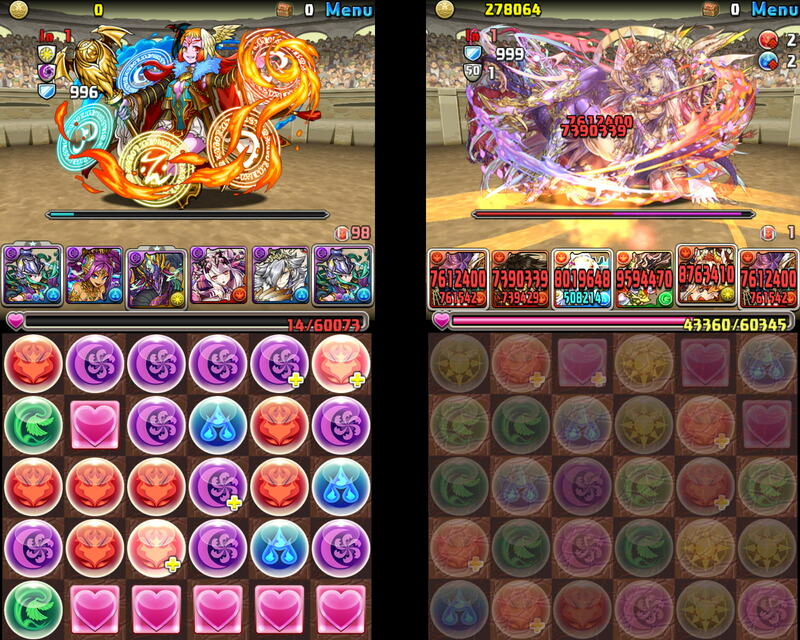 Right: My team doing some serious damage to Kali. The game frequently gives away magic stones and other goodies for free, using reciprocity to make a player feel motivated (or obligated) to keep playing. Also, you get more rewards the more consecutive days you log in, which helps players make the game a daily habit à la Snapstreaks. The most powerful cards, of course, are very rare, so there’s intermittent variable interval reinforcement when you get lucky and land a good card. There are special events every few weeks called “Godfests,” which are the only times players can get certain rare cards, creating some serious FoMO. Once you’ve invested time and energy to assemble a nice collection, there’s a strong tendency towards loss aversion, as no one wants to feel like they’ve wasted all this time for nothing. Since most of PAD’s players are young men, many of the most desirable cards feature scantily-clad female characters, a.k.a. “waifus.” And there’s a community aspect as well, with multiple forums devoted to the game where players share their accomplishments and good Godfest luck, leading to upward comparisons and social reinforcement. Despite all that, I’m not sure I would say that I was addicted to the game in a clinical sense. I was spending ~30-60 minutes a day playing the game, and maybe another half hour a day reading about it. My personal relationships and work did not suffer, as far as I can tell. Over the course of 2 years, I spent a grand total of $10 on in-app purchases of magic stones. On PAD forums there are reports of “whales” who've spent upwards of thousands of dollars on the game, so I got off relatively easy, at least in a financial sense. Still, how PAD affected my mind is undeniable. Instead of reading blogs related to psychiatry and mental health, I was reading blogs and watching YouTube channels related to PAD. I stopped even thinking about my blog, and every time I had a spare moment, I would open the PAD app instead of taking in my surroundings or reading a book. In fact, I read far fewer books in 2016 and 2017 compared to any other year in my life since I learned to read, though part of that may be due to reading more on the web. It wasn’t all bad, though. I wasted far less time on Twitter, and I was no longer waking up in the middle of the night with ideas for blog posts. I had a convenient and pleasant distraction from politics. And I’ve spent much less mental energy these last 2 years obsessing about my fantasy football teams than I have in previous years. Lastly, some advice for parents out there: as fun as Super Mario Bros was for us in our youth, it does not remotely compare to the reinforcement mechanisms that today’s microtransaction-driven mobile games employ. I’ve heard multiple stories from parents about their kids stealing their credit cards to spend hundred of dollars on in-app purchases for games like Clash of Clans and Clash Royale. I now believe that parents should not be letting their kids play games like these, which all tend to use similar attention and money-grabbing tactics. As a general rule, this applies to any of the mobile games that you see advertised on TV; how else would those game companies have so much money to spend on prime time ad spots? Recently, regulators in The Netherlands have started investigating whether games that have “loot boxes” (a similar idea to the Rare Egg Machine) are a form of gambling and should be regulated as such. In my mind there is no doubt that these games can work very similarly to gambling, except you can’t actually win any money, so it’s in a way worse than gambling. Even if there are kids who can responsibly play these games without spending too much time or money, I would still strongly suspect that these games have an outsized influence on what their players think about—and stop thinking about—even when they’re not playing. And for me, that was ultimately the biggest negative impact.